55 percent of women and 48 percent of men make an open secret of their wish list. About 70 percent of the asked consider important to also like what they are up to offer. And: The good old book is still the favourite gift. This is the result of a survey of Connox home design, one of the leading online shops for design furniture and home accessories, completed by the shop visitors. Safety is all: Most of the people would avoid ugly surprises. No wonder, two thirds of women and more than a half of men are delighted of what they received. Only about 13 percent of the asked exchange their gifts after Christmas and every fifth hides the gift flops in the drawer forever. Furnishing items (62 percent) and books (55 percent) are on most of the wish lists. While the last ones are often offered, only 28 percent of the people think of giving away furnishing items. Every fourth asked participant would be happy to receive a travel adventure or jewellery and both things aren’t usually offered. “This often depends on the price”, explained Thilo Haas, managing director of the Connox GmbH. “The participants of the survey weren’t asked to think of the affordability of their wishes. This is also recognizable when it comes to the question about gifts they liked the most: People mostly answered with expensive presents like travels, jewellery and cars.” Something less creative but really desired by 20 percent: cash. But only each tenth actually offered it. Next to books (67 percent) more than half of the questioned of this year offered home decoration and more than a third of the surveyed offered toys. Self-made things are mostly offered by women (41 percent) – and these ones are also mostly delighted by such gifts (36 percent, men: 23 percent). For those of you who plan to offer sweets, you should think twice: Every third participant buys chocolate or sweets and only every eighth likes such gifts. Vouchers split the community: Every fifth says he likes vouchers, but they also appear when asked which presents were flops. To bu clothes is also difficult and worth to think of. „We’ve got a wish list at Connox, as one knows it from Amazon. With it, our customers will be able to collect their wishes and share them with friends and the family”, explains Thilo Haas. “Every present will delight like this”. Most of the people make presents (98 percent). Thereby the budged for family members often moves between 51 and 100 euros (35 percent) or between 101 and 200 euros (21 percent). The partner generally receives a bigger gift: The budget is between 101 and 00 euros (34 percent) or between 202 and 500 euros (22 percent) for him/her. Different criteria play a role when it comes to choose a present for Christmas. Nearly 70 percent of the offering people find it important to like the present as well. But each tenth participant doesn’t care about how it suits the endowed. The budget is important for half of the people when it comes to choose a present – for customers under 30 years even more than for those over 30. 44 percent of the survey participants also concentrate on brands, quality and material. Nearly all of the people (93 percent) buy a part of their Christmas gifts in online shops – men and women. Seven of ten surveyed also visit the city enter und more than a half go to specialized markets, every twelfth buy Christmas presents on flea markets. Most of the people (69 percent) start to think of Christmas presents one month before Christmas. 5 percent even buy their presents on the 24th of December. For whom do they buy presents= The partner, the family and also, every seventh participant offers something to the colleagues. 1,609 women and men participated in this survey. 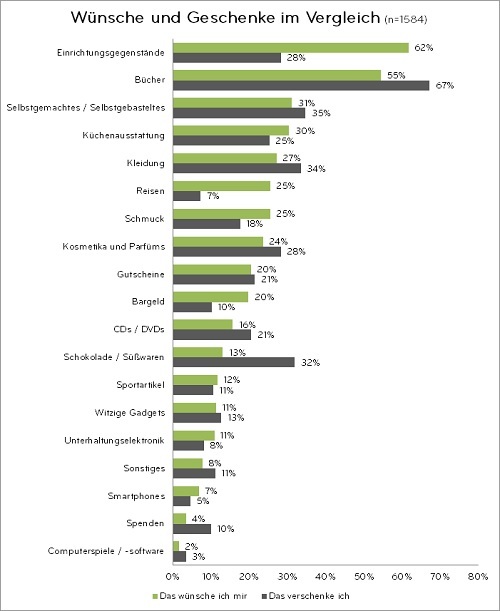 Please find more information of the composition of the participants as well as graphics with results in details in here: Connox presents survey 2014 (German results).